. . . such a neat “solution” to the mystery of James’s deep genius does not square with my James—the hazy but ever-present character I have inadvertently invented as I read and reread him, who speaks not only through but from behind his works.
. . . when bombs began to fall over Europe, many Americans were forced to see horses in a new way – as dinner. . . . [M]any Americans objected to eating it, whether for religious reasons or because they felt distaste at the prospect of eating a cowboy’s companion. 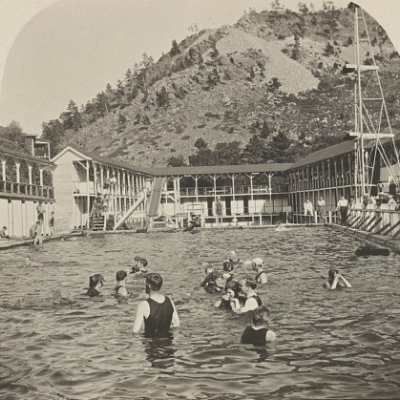 Swimming Pool Elderado (sic) Springs Colo. c. 1900. Stereograph. Retrieved from the Library of Congress. <www.loc.gov/item/2018645686/>.